Purepotions was founded by a mum so desperate to find an effective, steroid-free emollient for her daughter's chronic eczema that she ended up making her own all-natural ointment instead. This formula worked so well for her little girl that the very same ointment she cooked up in her kitchen is now sold worldwide. 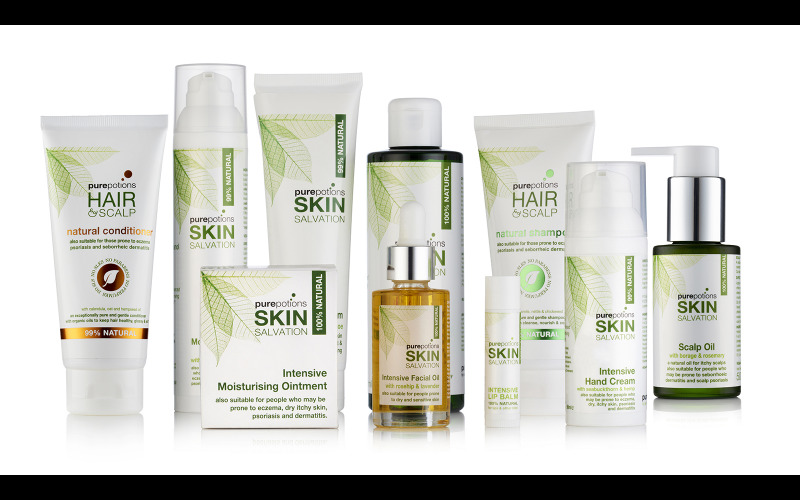 Purepotions makes a whole range of natural lotions and potions that are particularly suitable for people prone to allergies and eczema, those with sensitive or dry skin, or those who want to avoid potential irritants, toxins or pollutants in their skin care regime. All our products are eczema-friendly and are made with natural, often organic, ingredients to nourish, soothe and protect. When Natalie Balmond first experimented with making a balm for her daughter's dry skin, she used EFA-rich hemp seed oil, beeswax and biodynamic herbal tinctures of calendula, chamomile, nettle and chickweed. We still use the same nutritious natural ingredients in our products and leave out the nasties, specialising in products that are free from the synthetic ingredients that can cause flare-ups, irritation and rashes. So lovers of natural beauty can treat themselves and still be sure that they are being as kind to the planet as they are to their skin! We've put together some boxes of goodies from our pure and gentle, award-winning Skin Salvation range for four lucky winners. The bundles include our original award-winning hero salve as well as a rich daily moisturiser, an intensive hand cream with sea buckthorn, luxurious face and body oils with rosehip and hemp seed, our natural SLS-free shampoo and conditioner, an all-natural scalp oil and a handy little lip balm. All your skincare needs can be met without any toxic ingredients which means the products are particularly good for children, pregnant mothers, and those with delicate or fragile skin. You can find more information and check out the whole range at Purepotions website: just click here. None of our products contain petrochemicals, perfumes, parabens, PEGs, palm oil, animal-derived glycerin, synthetic emulsifiers or SLS. They are instead made from cold-pressed organic natural oils, biodynamic herbal tinctures and essential oils.